Eighty percent of our rescued elephant arrived with mentally issue. Most from abused and over work. It have to take time for our team to work to try help them therapy show them cares and love. Many still on half way of treatment. It’s very important for all of visitors to learn and understand their background. When their arrived at our place. We allow the elephant to walk free and they can go all over around the park. Safety rule is one of our priority. It not just only the visitor safety, but it also helping our work to heal the mind of elephant. To make they feel that we are there for them. We love and respect them. Thanks to all of your support to help us to make the change and to be a better. Special Thanks to Tom Oliver our Elephant Ambassador to host this video. Faa Sai, the abused elephant has recovered herself with love from the herd and the freedom of living bring her the happiness. 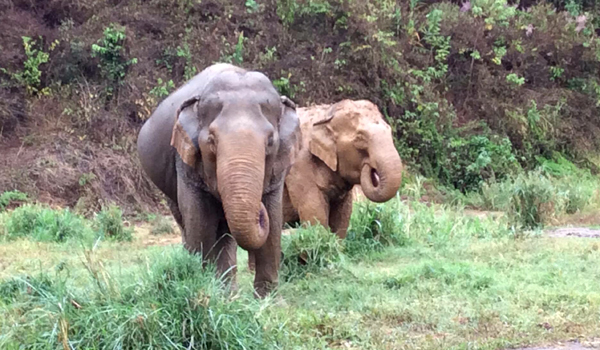 Second year of freedom, Jaem Sai was rescued to ENP since March 2014.